Ulfgar Fog-Eye is an easily annoyed Nord commoner, who operates the lighthouse in Anvil. He has rented out the cellar of the lighthouse to a mysterious psychopath, an action he regrets. During the related quest you will have to acquire his cellar key in order to sort out the treachery against the Dark Brotherhood and save Lucien Lachance from the rage of the Black Hand. Dedicated to the maintenance of the Lighthouse, Ulfgar only allows himself one hour of sleep each night and lives a quiet existence on his small peninsula near the Anvil docks. He wakes up at 8am and immediately heads downtown to the Chapel of Dibella for four hours of praying. He returns to his quarters at noon and wanders around until it is time to turn on the Lighthouse Lamp at 5pm. He then spends the entire night near the lamp, enjoying the view of the harbor and the Abecean Sea. At 6am, he turns off the lamp, and at 7am he finally heads downstairs and goes to bed. When the Knights of the Nine plug-in is installed, Ulfgar will change his behavior slightly. Instead of going to the Chapel at 8am, he spends his mornings listening to The Prophet for four hours. After Knights of the Nine is completed, he will return to his usual routine. 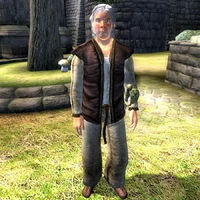 Ulfgar wears a set of middle class clothing: a brown shirt, light brown linens and a pair of thick cowhide shoes. He is armed with a steel cutlass and carries the key to the lighthouse cellar along with a small amount of gold. When approached for the first time, he will reveal his hospitality: "Aye. I'm Ulfgar Fog-Eye, master of the Anvil lighthouse. Visit the lighthouse any time. Fine view of the town and harbor." When talking about Anvil, he will mention: "Ships sail from Anvil harbor for ports-of-call in Hammerfell, Summerset Isle, Yokuda, and the Western Isles." "Oh, do you now? And just why should I give you that?" If you don't I'll slice your throat. "Oh! Well in that case, um... Here you go!" The Dark Brotherhood demands it, dog! "The Dark Brotherhood? Okay! Okay! Here! Here's the key! Just don't hurt me! I won't say a word, I swear! If you're here to kill that fellow in the cellar, then... good! I won't call the guards or nothing! He's doing... unnatural things down there! I heard the screams! And... and the smells! I never should have rented out that cellar! Never!" "All right, that's it! You've gone and annoyed me, now! Have at thee!" After this, he will attack you and you will have to either fight him or yield to make him stop. The second and third options will not trigger any further conversation. If you choose the demanding tone, saying; "The key to the cellar! Now! ", Ulfgar will hand you the key with no further objections: "What? What's the meaning of this? What's going on here? I don't want no trouble! Here, take the damn key!" If you choose to say nothing, Ulfgar will be on his way with the words: "Look, I've got things to do, and I don't need crazies like you getting in my way. Take a walk." When approached after all this, he will just ask you to leave him alone: "Look, I... I got nothing else to say to you. Just leave me be!" During the related quest, a distraught Enilroth will point you toward Ulfgar after you interrogate him saying, "Maybe Ulfgar Fog-Eye can tell you more. He's the lighthouse keeper, and probably rented out the cellar. Talk... talk to Ulfgar. He's sure to have the key to the cellar. You know, if... if you want to get down there! Now please, just let me go!" Some of his packages refer to him as Uthmund Fog-Eye. This page was last modified on 12 July 2018, at 02:13.